Make the most of your stay and experience some of the many events, attractions, and activities our community has to offer! We work hard in Cumberland County but also know to enjoy our evenings and weekends. With world-class golf courses, a botanical garden, historic and cultural museums, performing arts and live music, a Minor League Hockey Team, and an Astros Minor League Baseball Stadium under construction, there’s always something to do, see, or experience. Fayetteville is also the home of growing craft-brewing and food truck communities and features many restaurants that specialize in international cuisine. Whether you’ll be here for a day trip, multiple nights, or a long weekend, check out FACVB’s Events Calendar for a list of festivals, concerts, sporting events, exhibits, and other activities taking place during your visit. Transportation to and from Fayetteville is easy with the FAY Regional Airport offering daily flights via Charlotte, Atlanta, and Washington, D.C. We’re also centrally located on I-95, placing our community within an 8-hour drive of 2/3 of the U.S. population. 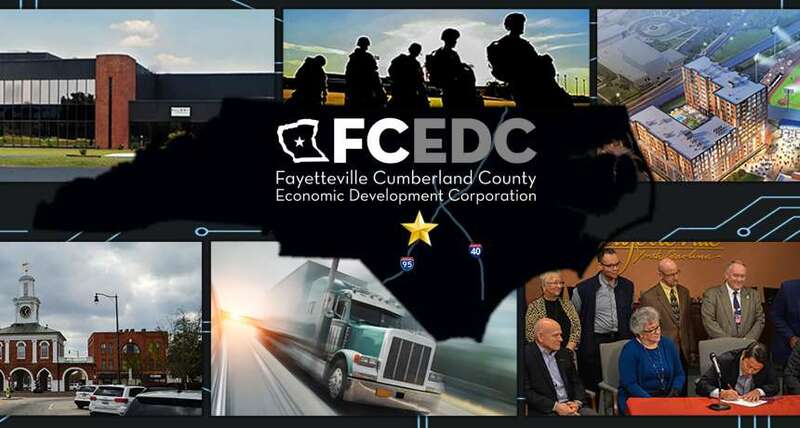 The Fayetteville Cumberland County Economic Development Corporation (FCEDC) is a public-private partnership dedicated to facilitating business projects, supporting existing industry, and preparing sites for expedited development. Visit our offices in Downtown Fayetteville or contact our team to find your opportunity in Cumberland County, NC.